It is not just in Wadi Hammamat-- the mining region of the Nile Valley in Egypt -- that you can find ancient carvings on rocks. It can also be found in the Philippines, specifically, in Angono, Rizal. The Angono Petroglyphs were discovered by Carlos “Botong” Francisco, National Artist, in 1965 during a field trip with a troop of boy scouts. According to Roden Santiago, Museum Guide and Officer-in-Charge of the Angono Petroglyphs, the word petroglyph comes from the greek word “petro” meaning rocks and “glyphs” meaning encrypted. Santiago said that the Petroglyphs is considered rock art which is the oldest form of art. “It can also be considered a mural,” he added. This rock shelter, often mistaken as a cave, was made during the Neolithic period (New Stone Age). There are 127 figures engraved in the walls of the rock shelter, 51 figures were distinct from each other, thus the possibility, that this was made by different tribes or of the same tribe but of different generations. They theorize that the carvings -- human like and animal like-- were associated with curing rituals done by the undistinguished tribe. “It withstood 3,000 years of heat and humidity before it was found,” Santiago said. He also said that the destruction of the petroglyphs was due to human factors-- humans vandalizing the rock shelter. "Since the viewing deck was built in 1997, this was already prevented,” he stressed. He added that the viewing deck was built for guests to view the carvings without actually touching them. In 2001, the Department of Tourism (DOT) inaugurated the Angono Petroglyphs Mini-Museum that contains the basic information on the petroglyphs and some additional exhibits such as the “baybayin,” otherwise called as “alibata”. Santiago revealed that the University of the Philippines conducted studies on the petroglyphs, even though the museum has not received the findings yet. In the future, he plans to build a website dedicated to Angono Petroglyphs that includes directions on how to get to the petroglyphs, since going to the site is hard. 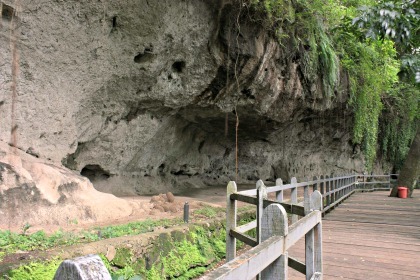 He plans to make a detailed direction on how to go to the heritage site, but for the meantime, he suggests that visitors come to the petroglyphs from Antipolo City. He also disclosed that visitors come by bulks during field trips, once they had 18 buses coming from Bangkal Elementary school in Makati, City. Santiago said that the most number of visitors comes from Far Eastern University (FEU).